Our friend Janet came bearing gifts from her garden again and bestowed upon us a mess of okra from the winding down plots in the back yard patch. Monique and I decided to honor the okra with splendid fashion by building around it’s foundation a version of our own Succotash, with a Creole angle. What makes this a Creole variety is the use of the Cajun/Creole Trinity, the onions, celery, and bell pepper which is the American version of the French mirepoix. 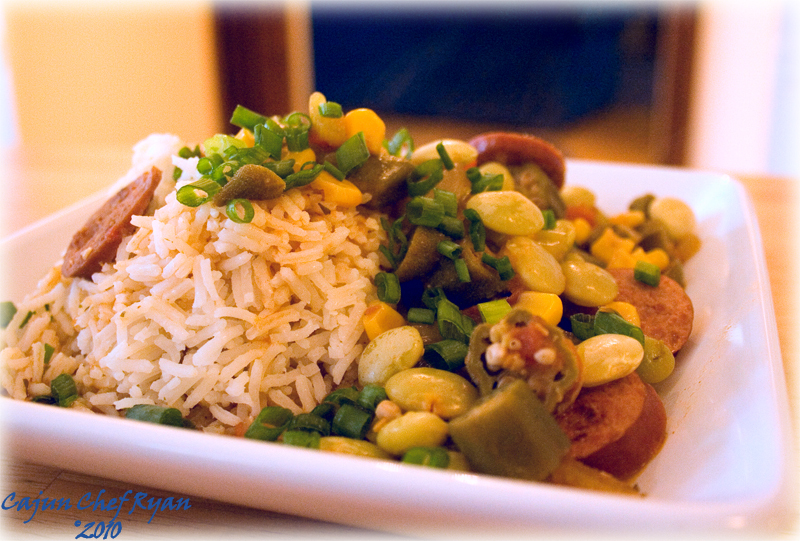 Of course, the okra and tomatoes brings this dish to the deep roots of Creole and southern Louisiana heritage. Succotash derives its original meaning from the Narragansett word msickquatash, which translated from the Native American Mohegan-Montauk-Narragansett language as “boiled corn kernels”. This dish has evolved over time to include lima beans, other beans, tomatoes, sweet peppers, and sausages or pork based proteins in some southern versions. Our version includes this and the fresh garden okras, creating a unique one-dish meal when accompanied with some fresh cooked rice complete the assembly. TIP: One cup of uncooked white rice will yield about three cups of cooked rice. As a rule of thumb, use two cups of water for each one cup uncooked rice, with a pinch of salt. Bring to a boil, cover and reduce heat to a simmer for twenty minutes. Fluff with a fork, and remain covered for another 5 minutes. 1. Heat the olive oil in a large stock pot over a medium-high heat and brown the sausage for about 5 minutes. Add the onions, celery, and bell pepper and sauté until soft, or about 8 to 10 minutes, stirring often, then add the garlic and stir well. 2. Add the bay leaves, corn kernels, lima beans, tomatoes, chicken stock, okra, and thyme. Bring to a boil, cover and turn heat down to low and simmer 20 to 25 minutes, or until lima beans and okra are tender. Stir occasionally. Add the salt, pepper, and hot sauce and season to taste. 3. When ready to serve portion out ½-cup servings of rice with 1-cup of the Creole Succotash, then garnish with the chopped green onion. I hope you enjoy this recipe as much as we all did. This recipe makes about twelve servings. If you want to speed up the process you can use frozen corn, frozen lima beans, and frozen okra, and you can cut the simmer time down to 10 to 12 minutes or so. This sounds so delicious! I bought some okra yesterday and I will have to give this a try. What a unique idea for the okra! Sounds really different and delicious! This is a great way to use up all those lovely veggies! Good luck with Project Food Blog! Looks wonderful, full of colors and flavors. Oh, I miss okra! We grew it when I was growing up, but not out here (CA). Thanks for this and good luck with Project Food Blog! I love southern succotash!! And ya might as well forget that one cup serving business when I’m around a pot of succotash. 😉 Have a wonderful week. I love okra and I am definitely going to try this recipe.. Thanks for sharing. Love the okra in there! YUM! wonderful flavors here especially better with Turkey kielbasa! This is an excellent succotash and I do love the okra in it! 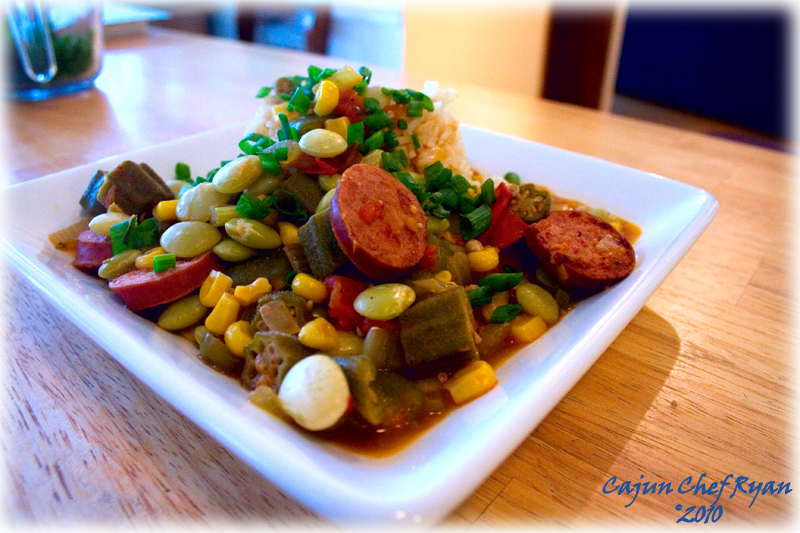 What a unique and special recipe, full of ingredients and flavors – this Creole looks so good! Oh, I died and went to heaven. I love that succotash (and the related Brunswick stew) is probably the oldest of US Southern comfort food dishes, and yet we have so many variations on it, depending on locale. It’s so nice to learn of your excellent Cajun version, including seasonal okra. What a wonderful idea! Looks delicious. I think I might just have most of those ingredients on hand….except the okra. I’m thinking I am going to have to look in my local grocery store for some. What a treat! What gorgeous succotash! Will try! So that’s what Succotash is. I never knew anything about it.